“When Chaplain J. F. Fleming was assigned to duty in the summer of 1912, he became the first chaplain to have exclusive duty with the Marines. He served on board the California when the Marines were sent to Nicaragua. “The first full-time duty assignment with Marines went to Chaplain Bower R. Patrick when he was ordered to the Marine Expeditionary Force of the Atlantic Fleet in April, 1914. “Establishment of a Marine Base at San Diego just prior to America’s entry into World War I saw the second Navy chaplain assigned full-time duty with Marines. He was Leroy N. Taylor who served with the Fourth Marine Regiment from August, 1915, to December, 1916. The chaplain accompanied the regiment to Santo Domingo in 1916 and distinguished himself in an engagement in which the Marines took part. For his actions as an ambulance driver and his courage in advancing through fire-swept fight zones he was presented with the Letter of Commendation by the Navy Department. “The colorful history of the Naval chaplaincy is also the story of religion in the Navy and Marine Corps. From the day when unordained men could be appointed a chaplain for the duration of a ship’s cruise, to the time when the Chaplain’s Corps came into its own with a chief and with high standards governing the selection of its members, they have met the challenge of the chaplaincy. At the same time they have waged a fight against odds to win equality with the members of other corps, and for years labored under discriminations regarding pay, uniform regulations and working conditions. “The chaplains did not fight for betterment of their corps to the exclusion of the men’s welfare. Religious ministrations came first. Their consideration for the welfare of their men brought growing respect to the corps and many of their members were responsible for a number of ‘firsts’ in the Navy. Some of their innovations won plaudits from their en, others brought fort no kindly messages. “While the chaplains were furthering the spiritual, moral, physical and mental welfare of their Navy men and Marines, one of them brought about the substitution of coffee for the daily grog rations which were issued aboard ships in the ‘Old Navy.’ This switch was credited to Chaplain George Jones. “When Chaplain Edward McLaughlin wrote an article in condemnation of ‘flogging’ for an issue of Sailors Magazine in 1830 it caused so much resentment against this form of punishment that it was abolished in the Navy. 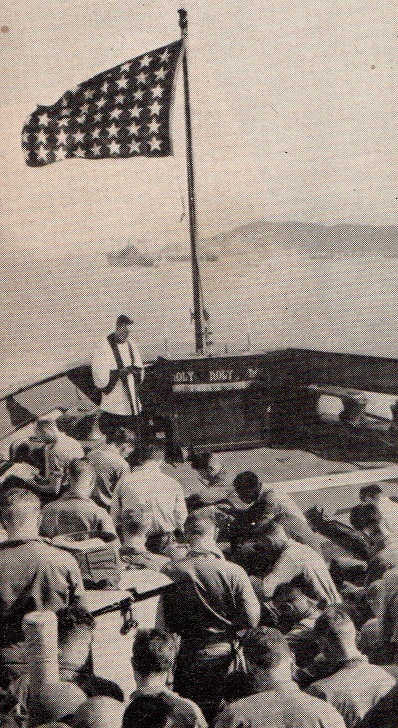 “Protestant divine services are held for troops enroute to Wonsan invasion” (Official USN Photo). “When steam pushed the sail into the museum, life at sea was easier. The men became soft, some of them fat. Chaplain Wesley Holway believed that the Navy’s strength depended on the strength of its men. He started the practice of daily ‘setting up’ exercises for the crew in 1898. “The premier showing of a movie aboard ship was shown to the crew of the USS Yankee in 1903 by Chaplain B. R. Patrick. It was an instant hit and the men insisted upon sitting through repeated showings of the same film. “A school for midshipmen was held at the Washington Navy Yard 40 years before the Naval Academy opened at Annapolis. In three months Chaplain Robert Thomas taught his students enough navigation to enable them to pilot a ship to any known part of the globe. 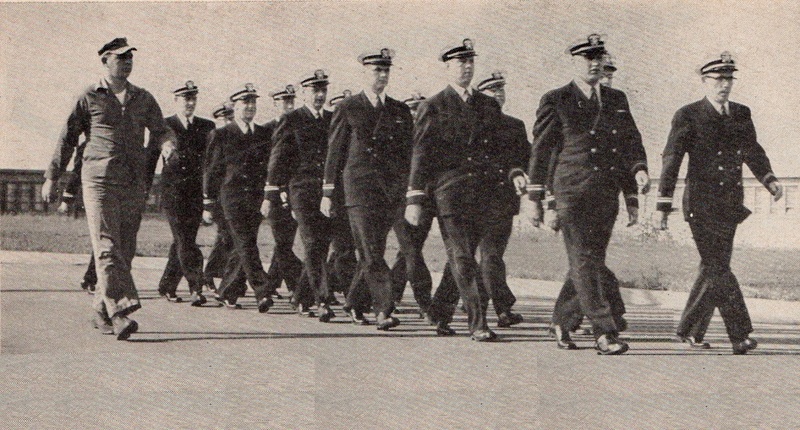 “In 1919 the first Naval Academy Preparatory Class started at Newport, Rhode Island. Under the coaching of Chaplains John Brady and J. D. McNair, many enlisted men won appointments to Annapolis. “Chaplain Truman P. Riddle believed he could be of greater service if he could share the viewpoint of the enlisted men. He resigned his commission and enlisted as an apprentice seaman. After five months, during which his shipmates were unaware of his true identity, he was reappointed a chaplain. Later he helped establish the educational system of the Navy. “Today’s ably administered Chaplain Corps translates spiritual leadership into terms of practical service through its chaplains. Likewise, each chaplain translates this leadership by making readily available to any Navy man or Marine all the resources of religion and morality at his command. “Perhaps the greatest demonstration of this leadership came with the advent of Pearl Harbor. On December 7, 1941, there were only 192 Regular and Reserve chaplains on duty in the entire Navy and Marine Corps ashore and afloat. The brunt of the first casualties fell upon this tiny percentage of the nearly 3000 Regulars and REserves who augmented the corps before the end of the war. This small cadre furnished the major leadership in the complex administration of the Chaplain Corps during the early period of World War II. The magnitude of this operation can be shown by the comparative strengths of our armed forces before the WW II build-up. The total armed strength of the Navy including the Marine Corps and the Coast Guard on September 30, 1939, was 157,246. O V-J day the total strength topped the 4,056,000 mark. “This leadership was not of the swivel chair variety for before the first six months of the war had ended the Chaplain Corps had lost four of its men in action. Before the end of hostilities ten were killed in action. To the ranks of the Chaplain Corps went 93 medals and awards ranging from the Medal of Honor to Letters of Commendation with ribbon. “To meet the initial thrust upon their physical resources. the Chaplain Corps maintained a school at Williamsburg, Virginia. When the war ended the school was closed and new chaplains entering the Navy were trained under senior chaplains at regular duty stations. 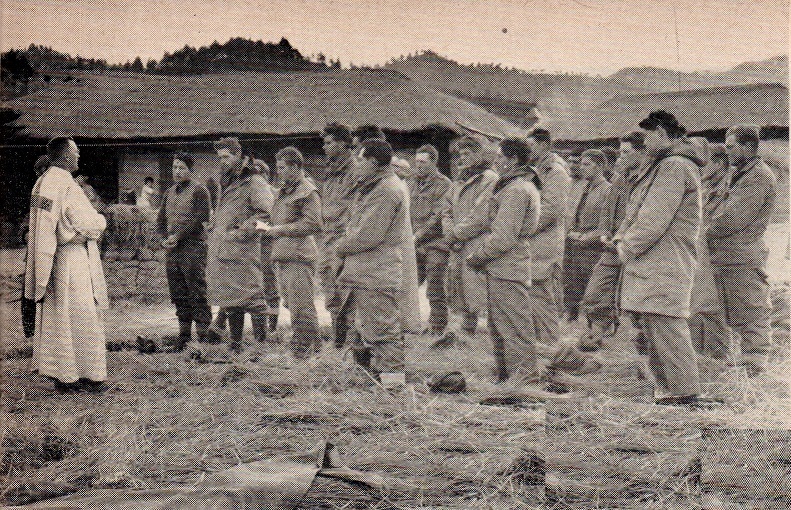 “A chaplain holds mass for troops of the First Marine Division in Korea” (photo by Corp. B. R. Uthe). “Mobilization resulting from the conflict in Korea demanded many more chaplains than were in service at the time. When it was realized that the number of new padres needed could not be trained adequately under the senior chaplain system, the school was reopened–this time at Newport, Rhode Island. “Like all recruits, the chaplains go through ‘boot camp’, where they get a good dose of military and physical training. 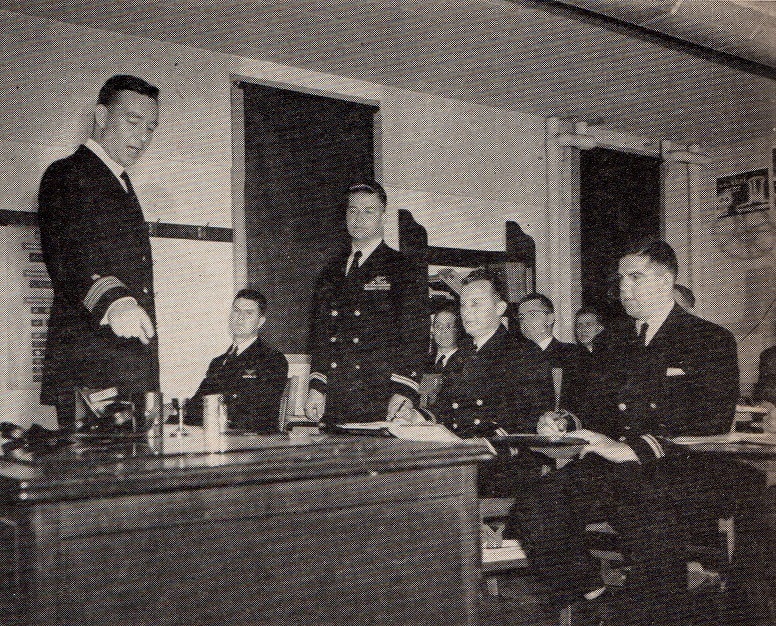 Then, for seven hours each day, five days each week, they are schooled in Naval Orientation, Audio-Visual Aids, HIstory of the Navy Chaplain Corps, Naval Law, and first aid. “Weekly field trips to nearby Naval activities afford the new chaplains opportunities to observe the Navy at work and to see a demonstration of the chaplains’ place in the general scheme of Navy life. 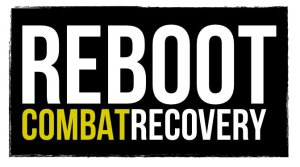 “Reserve chaplains who come back on active duty, attend the school for refresher courses in the latest changes in Navy REgulations and organization since their last period of active duty. “A student chaplain class received instructions in the use of the different types of ecclesiastical equipment carried in the field services” (Photo by W. J. McFarland, USN). “The school provides an unusual opportunity for clergymen of various faiths to know each other better. They attend classes together, drill together and visit each others’ services. This cooperation and understanding pays off. If a graduate is transferred to a small shore station he might be the only chaplain and serve men of all denominations. He will know what his responsibilities are in guiding men of other faiths. “It pays off on the front lines, too. For here there’s only one way to determine a man’s religion–from the letter stamped on his dog tags. One look and the chaplain knows an injured man’s preference. The lad may be Jewish and the padre a Catholic-but if the Marine wants a prayer, he’ll hear his own–and maybe in Hebrew. *by Lieutenant Claude R. Lewis, Leatherneck, April 1952, pgs 22-24 (inclusive of text and photos).